Canon A590 IS: a best-seller that still fits most photographers’ dreams! It’s been around for a while, it may not have all the techno-features of the very latest competitors, but the Canon PowerShot A590IS 8MP Digital Camera with 4x Optical Image Stabilized Zoom is still one of the very best compact cameras around. Take a look at this chart from 1001noisycameras.com and spot which camera (not just compact models) is the best seller! 5cm macro (! )Last but not least, Canon offers optional accessories for the A590 IS, including Selphy Photo Printer and converter lenses!Why we do love it? Besides high-ISO ability, the Canon A590IS is one of the very few compact cameras featuring true photographic controls hidden within the 13 shooting modes: Aperture and Shutter Priority modes, the one that really give any amateur photographer the right tools to take control over photo shooting the good ol’ way and right the same way as DSLRs do. Don’t dismiss the Canon A590IS and give it a second look: it’s now even more affordable than ever at US$ 109.00! Valentine’s Day special: digital photo keychain roundup; have pictures of loved ones accompany you everywhere! Oh no, Valentine’s Day again! It’s always so hard to spot the right gift for your beloved one! What about a techy keychain with a tiny display frame showing the pictures of your love all the time? Take a look at the Axion AXN9100R 1.1-Inch Heart Shaped Mini Digital Picture Frame. It’s heart-shaped (what else?) and it’s sooo nice! The Axion AXN9100R supports JPG and BMP Files, its internal 4MB flash memory supports up to 56 pictures, has a USB input jack for transferring photos from PC and, of course, a built-in USB rechargeable battery. Yours for only US$ 12.99! 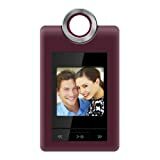 What about the Coby DP152RED 1.5-Inch Cliphanger Key Chain Digital Photo Frame? The Coby DP152RED 1.5-inch cliphanger key chain digital photo frame has CSTN LCD full-color display; displays JPEG, GIF and BMP image files; stores over 60 photos; features photo slideshow mode; has integrated rechargeable lithium-ion battery; USB port for fast file transfers; digital clock display; digital calendar display; Carabiner with “gate lock” design for secure attachment; available in red. Featuring a photo slideshow mode, the Coby 1.5-Inch sports an excellent image quality with a 1.5-inch LCD full-color display. 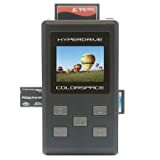 Includes 16 MB flash memory and can store up to 60 photos and displays JPEG, GIF, and Bitmap images files via a USB port. Olympus Stylus 1050SW: a 10.1MP Compact Digital Camera, rugged, tough & full of features. The Olympus Stylus 1050SW is a brand new 10.1MP Compact Digital Camera with 3x Optical Zoom and a pack of features that makes it an almost perfect all-weather all-terrain companion! While other digital cameras may use touch screens to access settings, the new Olympus Stylus 1050SW has a shockproof, waterproof and freezeproof body that is sensitive to touch all over. So getting to the most common menu settings in situations where pushing buttons takes time or is difficult is now as fast and easy as a tap on the top, back or sides of the camera. The rugged 10.1-megapixel Olympus Stylus 1050SW is designed to take the hard knocks that everyday life–particularly those with kids–can throw its way, so you know that the memories it captures will be protected. It can handle five-foot drops to the hard ground, operate in freezing snowstorms, and swim with the fishes — lethal conditions for most other digital cameras. Additionally, the sleek, lens-protecting faceplate slides down, turning the camera on and revealing the lens in an instant to capture the moment. The shock-absorbing technology designed into the Olympus Stylus 1050SW minimizes the impact delivered to the lens and circuitry when the camera is dropped from heights up to 5 feet. Whether the camera slips out of a backpack or a toddler drops it down a staircase, the Olympus Stylus 1050SW can take a licking and keep on clicking. The Stylus 1050 SW performs as well under water as it does on land because its lightweight, aluminum exterior is matched with interior rubber gaskets and O-rings to seal out the elements. It can take photos while being fully submerged to depths of approximately 10 feet (3 meters). The inclusion of a preset underwater scene mode makes the Olympus Stylus 1050SW perfect for snorkeling or a day in the pool. It also features a water-repellant lens coating to prevent water droplets from forming on the lens to get crystal-clear shots no matter how wet the shooting environment. Unlike other point-and-shoot cameras that freeze up in frosty weather, the Stylus 1050 SW still performs when the temperature dips well below freezing (down to 14 degrees Fahrenheit; -10 degrees Celsius) so it is ready when you are to make a snowman or hit the slopes. Vestalife Ladybug Portable Speaker Dock for iPod: save up to US$ 20 off the regular price! You are currently browsing the SourceCrowd.com weblog archives for February, 2009.